Zortam Mp3 Media Studio is all-in-one Mp3 application that contains Mp3 ID3 Tag Organizer for searching and organize Mp3 files into Mp3 library, auto tagging for your Mp3 files, editing ID3v1 and ID3v2.4 tags (ID3 Tag Editor,Mp3 Tag Editor, Mp3 Tagger), Zortam Mp3 Player with lyrics visualization, iPod to PC transfer, CD Ripper with album cover art/lyric support that uses CDDB (Internet Compact Disc Database) and automatically writes ID3v1 and ID3v2.4 tags.CD Ripper downloads album cover arts and lyrics from the Zortam Music Database(ZMLIMD) as you rip your CD (CD Ripper with lyric/cover art support), Mp3 Normalizer with custom volume level allows normalization of your Mp3's (Batch Mp3 Normalizer), search for song lyric from the internet (Batch Lyric Finder), search for album cover (album) arts (pictures) from the internet (Batch Cover Finder), batch lyrics and cover art finder from the internet (Batch Lyric-Cover Finder). 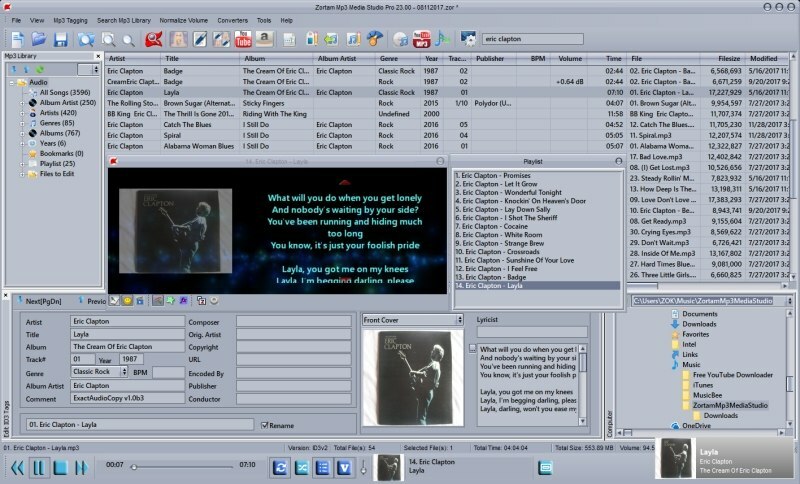 Burn Audio or Mp3 CD (CD Burner), Create lyric book in html format (cover pictures are included) from ID3v2 tags (Lyric Book), convert Wav to Mp3 files and Mp3 to Wav files (Wav/Mp3 Converter), manage M3u playlists (Playlist Manager), rename files using ID3 tags (Mp3 Renamer), search for duplicate Mp3 files, (Search Duplicate Mp3's). Play Mp3's using your favorite Mp3 player or Zortam Mp3 Player, add karaoke (Kar) and midi (Mid) files directly to ID3 tag (Karaoke Manager).All lyrics and cover arts (album pictures) saved with Zortam Mp3 Media Studio are compatible with Winamp, Windows Media Player(WMP), iTunes and visible on your iPod and any other portable Mp3 Player that supports lyrics and cover arts.Zortam Mp3 Media Studio is currently available in 12 languages. Version 13.10 includes unspecified updates, enhancements, and bug fixes.